Because the people are self-governed in our republic, the Constitution is not a document created by the government to describe what the government will allow the people to do. Rather, it is the exact opposite…it is a document created by the people (We the people) that describes what we will allow the government to do. This is an extremely important concept to understand. Through the concept of “consent of the governed”, we tell our government what it is allowed to do, NOT the other way around. One of the main aspects of the concept of American Exceptionalism is that in our constitutional republic, the people are the sovereign (meaning, they possess ultimate power)…not a king, not an emperor, not a dictator, not a warlord, not a President, not a Congress, not a Supreme Court, or some other sort of government body. how we will be governed. Well, at least among those who even know there is a Supreme Court. Maybe you would have answered the same way. But that is not correct. Because the people are the sovereign, the people always have the final say. “But that was a trick question!” your friends might protest. On the contrary, it is not a trick question. Rather, it is a concept that is the cornerstone of the foundation of our republic and all other principles are built around it. When people do not immediately recognize this when thinking about issues, the system breaks down and we end up with a totally out of control government, far from the size and scope that the people have consented to. As we progress through these essays, we’ll discuss the ways in which the people actually do have the final say, even above the Supreme Court. The people. We the people. You and me. That’s who I am. And, by the way, that’s who you are as well. Each of us Kings over ourselves, and all of us together, sovereign over our government. People today do not understand where the final authority lies…where the buck stops. They are mistakenly under the impression that if our government says something is so, or our Supreme Court makes a decision, then that’s it. Case closed. However, this is completely antithesis to the idea of our self-governing system. The thought that nine men and women in black robes will decide everything for us (or in many cases nowadays coming down to just one person who is the “swing vote”) flies in the face of the intent of our entire system. Once people realize where the real power is and the various ways to wield that power, we’ll be able to take control back from the politicians who have corrupted the system and put it back in the hands of the people, where it rightfully belongs. The People Are Sovereign! is a series of 30 essays that will be posted on a daily basis. 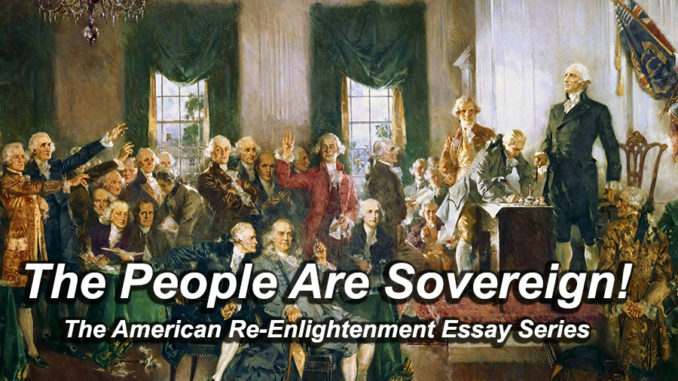 The series will continue tomorrow with Essay 4 – We Have Rights! To view the next essay in the series, click this link: Essay 4 – We Have Rights!